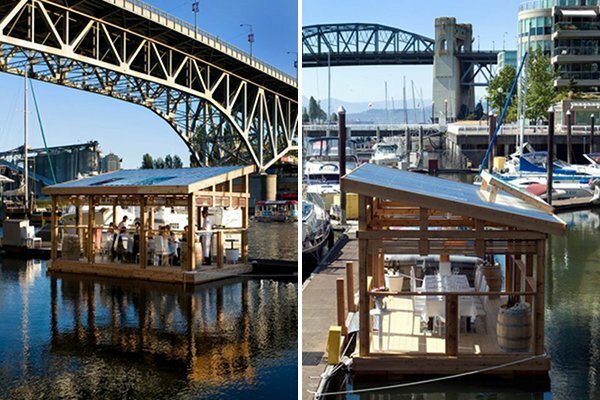 If fine green dining floats your boat then you wont want to miss this incredible pop-up restaurant in Vancouver that recently set sail upon a raft made from 1,672 2-Liter plastic bottles! The elegant dining room in Vancouver has a two-fold mission -- to increase awareness about the prevalence of plastic in our oceans, and to positively affect the sustainable seafood chain. Brought to you by the School of Fish Foundation and catered by C Restaurant, the Plastic Dining Room is serving a nightly six-course sustainable seafood menu. Moored at the False Creek Yacht Club, the restaurant features a plastic bottle construction reminiscent of the Plastiki, however it's taking a decidedly more elegant path to sustaining the seas through fine china, crystal glassware, and wine pairings. The Dining Room officially opened on July 21st and will continue to serve meals nightly until the end of September (rain or shine). The table can seat twelve people and a seat costs you $215 for a six-course meal, which includes organic and biodynamic wine pairings. The sustainable menu was designed and catered by chef Robert Clark of the well-known C Restaurant. The seafood menu is subject to change according to availability of ingredients, as any fine sustainable restaurant’s menu should. The designer dining room features fine china, crystal glassware, intimate lighting, soft music, and of course, excellent views of the water. The initiative is part of a summer-long awareness and fund raising campaign that seeks to gain public support and positively affect the sustainable seafood supply chain while rewarding and promoting the work already in motion. question: are those bottles actually meeting the water? Located at the False Creek Yacht Club, the Plastic Dining Room is moored amongst all the other yachts and sailboats and near the C Restaurant, which provides the catering. Hosted by the School of Fish Foundation and C Restaurant, the elegant floating dining room was designed to bring about awareness of plastic pollution in our oceans and sustainable seafood. The dining room is serving sustainably-sourced six course meals and wine pairings throughout the end of September. The menu is designed by C Restaurant, which is located nearby, and it changes depending on what is available and sustainable. Organic and biodynamic wine pairings are included in the cost of the meal. The floating raft was constructed off-site and is made from reclaimed pinewood. Hoisted into the water, the little raft floats amongst all the other fancy yachts and seats twelve people each night. 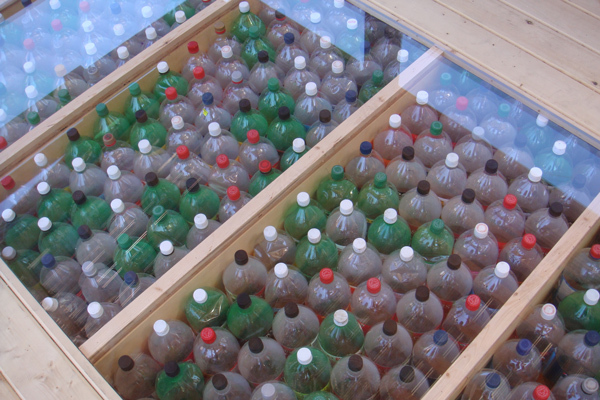 1,675 plastic 2-liter bottles are used to provide flotation for the raft. Shannon Ronalds and a marine engineer calculated how many bottles would be necessary to keep the raft afloat. The floor is mostly wood, but a small clear section in the center reveals the plastic bottles below. While diners are seated at the table they can look down at their feet to see the bottles. Installation of the plastic bottles in the raft. 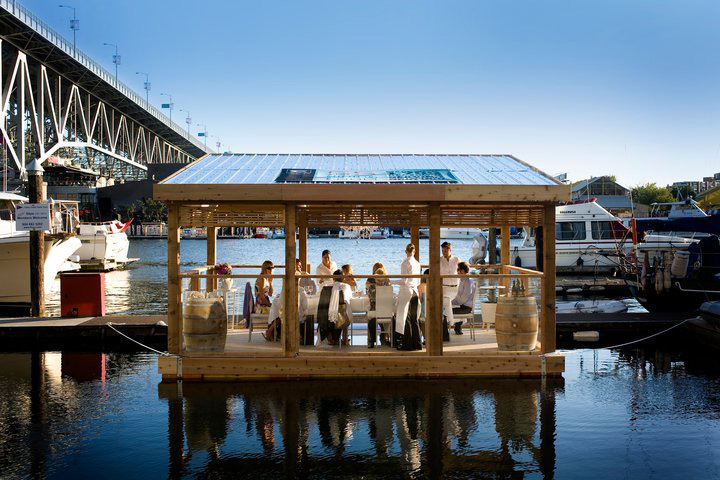 The floating plastic dining room represents the issue of our oceans becoming a collecting ground for discarded plastic; one of the many threats to our seafood supplies. All materials going into and coming out of this floating dining room will be renewable, recycled, reclaimed and/or repurposed. Front elevation of the plastic floating dining room. Side elevation of the plastic floating dining room.